I’m finally posting the 5 blocks I made for the sneak peek. I was waiting, because I’d hoped to make a few more, but I’m running out of time and I figured I’d better get these up at least! Nice blocks. 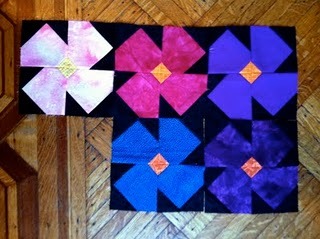 I'm loving all the blocks that everyone is making, but I am especially enjoying those with fabric choices that really feel like the texture/color of African Violets petals.